Sheryl Mulder, a school teacher based on the KZN South Coast had a dream to start a small school to support children with ASD (Autism Spectrum Disorder), as well as learners who experience developmental delays that make it difficult for them to learn in mainstream classrooms. If there's anything I’m coming to terms with at the moment it's that my idea of creativity and the substance of creativity are really quite different. The difference is in the work. All. That. Work. The process of preparing for your website, as in many other areas of life, is severely underrated. Preparation can make or break your experience of building a website. It can mean the difference between a smooth process and a headache-inducing one, between timeously met deadlines and (very) late nights, between an excellent, well-tested end product and a rush job. Many people don't prepare for their website build, either because they don't know that they can prepare (believe it or not! ), or because they don't know how to prepare effectively. Here are six ways that you can prepare for your Squarespace website build. I’ve been there. And so have you. For so long it has been a little secret that only you, and perhaps a few trusted friends, have known about. You’ve worked with it, fed it, coddled it, picked it apart, stayed up nights dreaming about it, whispered in hushed tones in coffee shops about it, worried others would steal your idea. You dreamed big dreams for it. Ooh Lulu is a wedding and events company based in Cape Town, South Africa. Zahida, the founder, ‘accidentally’ started her business after planning a family neighbour’s wedding. It was such a hit that people started asking her to plan their weddings too! As someone who builds Squarespace sites for a living, I get a lot of questions about the platform. People ask me things like: Is Squarespace any good? Why should I use it? Why would you recommend it? What are the capabilities? Is it cheap or expensive? How does it compare with Wordpress? Is it safe, or will my site be hacked? Bianca Bouverie is a super talented graphic and UI/UX designer who left the city to return to her small town roots and in the process opened up her own design studio. I've had the privilege of working with her on several projects over the last while, and am always impressed by her creativity, fast-paced work style, and no-nonsense approach to design. She isn't afraid to say when something isn't working, which when it comes to design is the kind of tactic that saves us all a lot of heartache! 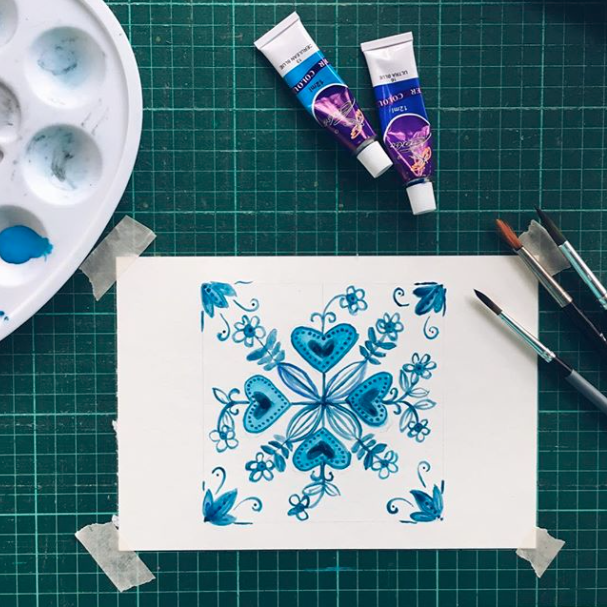 Casey Polson is runs an interior and property consulting service in Cape Town, South Africa, and she recently came up with a new business idea to launch a monthly subscription box based around interiors and homeware. Each month her team curates a box of bespoke and individual hand selected home items around a theme. The emphasis is on supporting locally designed and manufactured goods. Fiona Hobson, a retired high school teacher and farmer's wife, realised that many of the people employed on their Karoo farm were unable to read. She started teaching basic literacy in English and Afrikaans on the farm, and later reached out to the local school in Klipplaat, their nearest town, to see how else she could help. This initial action has become a charity called 'Five Loaves Two Fish.' Fiona, along with her husband Rob (who incidentally was among my first Squarespace clients), asked if I'd put together a site showcasing the work Five Loaves Two Fish are doing among their community as a place to start raising awareness and funds for ongoing reading programs. Crosby & Smalls is local Durban based business that sells retro and vintage goods. Okay, truth be told, this is a side business that a good friend of mine (Vicky) and I started to fund our travels! We launched last November with a simple strategy for growing our audience on Instagram and Facebook, and selling directly from those platforms. We had it in our minds that at some point we might need to transition to a proper e-commerce solution, but we wanted to give it some time to develop before we committed to the monthly payments. We've loved the personal interaction we have with our customers, and the relationships we're developing as we go along, but have found recently that it is taking up a lot of time and have looked again at some e-commerce options that would suit us. RiverLife Church on the South Coast of KwaZulu-Natal was ready to launch their first ever website, and wanted a site that would appeal to a cross-section of the congregation from teens, to young families, to more established members of the community. They wanted a welcoming, personal and easy to navigate site. Kundai Nachito has a fascinating story to tell - one that deals with notions of self, sickness and society. As a young black HIV+ woman in South Africa, Kundai's dream is to create a platform where she can first begin to share her story in the form of prose, poetry and photography, and then invite others to begin to share their stories. She is especially interested in the intersection between sickness and society, sickness and relationships, and sickness and love. I was toying with the idea of designing a minimal site for a graphic designer based on clean lines and pops of yellow. I was curious as to how it might turn out and put something together. I selected some bright and cheery photography with yellow elements, put together a moodboard and colour palette, and designed a simple site map. The focus of the project was to highlight the design work and let it shine, with a supporting about page, contact page and portfolio page. Here are some elements that went into this concept site. If you're a graphic designer looking to showcase your design portfolio in a clean and uncluttered site, please get hold of me to discuss building a site together. Alessia Pinna is a lifestyle and branding strategist based in Joburg. She wanted a clean, feminine site for her growing design and holistic lifestyle business - a website that would allow her to introduce herself, showcase her portfolio, share customer testimonials, display her range of services and enable her to start to build an email list. Oribi Gorge is a beautiful farming region just inland from the KwaZulu-Natal South Coast. The Oribi Gorge Guest Farm, a three-cottage establishment on a working farm right on the edge of the Gorge, has been in operation for about 20 years. Although they had an existing site, they felt it was time for an update both of the site and the photography, and asked me to work on something with them. Harry Gwala Agri is made up of a dynamic group of farmers with a compelling vision for their communities - to set up mentoring relationships, educational opportunities and business connections between experienced and emerging farmers. They're a new organisation based in KwaZulu-Natal and wanted a website and a few design items to launch with a bang, and share their news and progress with interested parties and potential funders. I partnered with graphic designer Bianca Bouverie to produce an informational brochure and Squarespace website to help get the word out there about their project. Farming tones are obviously usually all greens and browns, and we wanted to keep within that tradition. We were looking for earthy tones, and farm-related imagery within a uniquely South African context. We also wanted to emphasise the critically important role black farmers will play in this project, and as such needed the imagery to carry this across. One of my frustrations with the average stock photography site is that diversity in skin colour, culture and difference is hard to come by. And when you do find it, it is often reinforces stereotypes we're desperate to get away from in South Africa, and indeed Africa. I paird Montserrat with Adobe Garamond pro for the fonts and brought in the shades of green, stone and black for the colour palette. Thanks so much to the team at Harry Gwala for trusting me to put their site together. I really look forward to reading about their new projects and seeing how they continue to impact their communities with an incredible dream for this country. If you'd like to see more of my Squarespace work, here are a few sites I've been working on in the last while. 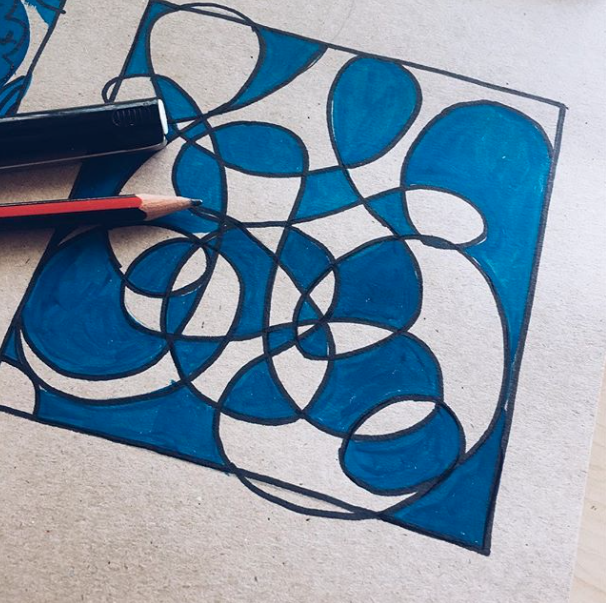 Albert Einstein said that creativity is contagious, and I certainly felt like I caught some creativity while interviewing a bunch of makers and creators last year about their journey into creativity. So much so, that I decided to embark on my own 30 day creative project. 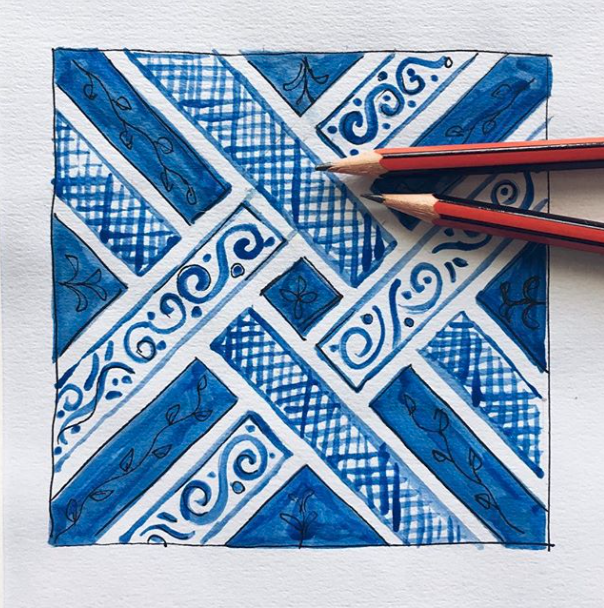 I brainstormed a few ideas and decided to stick to 30 days of working with blue and white tile pattern designs. Here are a few things I came up with. In Japan, the earliest known example of cloth dyed with a shibori technique dates from the 8th century. Until the 20th century, not many fabrics and dyes were in widespread use in Japan. The main fabrics were silk and hemp, and later cotton. The main dye was indigo and, to a lesser extent, madder and purple root. There are an infinite number of ways one can bind, stitch, fold, twist, or compress cloth for shibori, and each way results in very different patterns. "Arashi" is the Japanese word for storm. 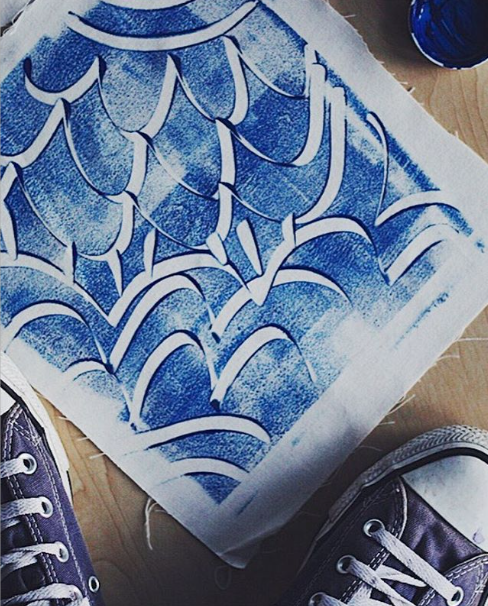 Arashi shibori is also known as pole-wrapping shibori. The cloth is wrapped on a diagonal around a pole. Then the cloth is very tightly bound by wrapping thread up and down the pole. Next, the cloth is scrunched on the pole. The result is a pleated cloth with a design on a diagonal. The patterns are always on a diagonal in Arashi shibori which suggests the driving rain of a heavy storm. then stitch the roll-up with a running stitch. Pull the ends of the rope together and tie tightly, then dye the fabric. The emerging pattern is a ‘honeycomb’ type effect. When folding the fabric to prepare for binding, use a concertina fold, folding the fabric back on itself lengthwise, then either into squares or triangles. The concertina fold ensures that the maximum amount of dye reaches the most amount of fabric. To make the folds even more exact, steam iron them before clamping and dyeing.